The weekend is for setting oceans ablaze with burning ships and trying very hard not to sink, or at least it is if you get into World of Warships second beta weekend. 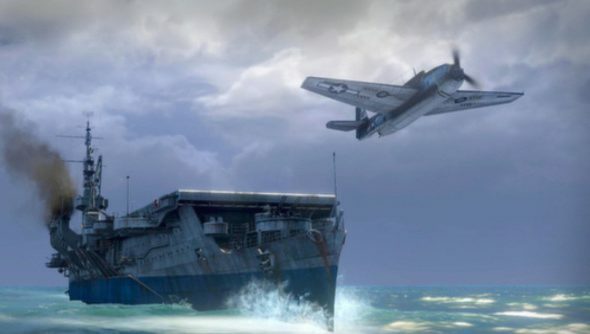 Wargaming is testing out a bunch of new things, including pitting all four classes of ship against each other, so that means the sky is about to be darkened, because the aircraft carrier will bring with it squads of pesky planes. Battleships, cruisers, destroyers and aircraft carriers will all be duking it out, which Wargaming says will show off the rock, paper, scissors (and battleships) nature of the nautical combat. There will be more individual ships in each class, too, including the Japanese battleships, Yamato and Nagato, as well as the American Pensacola cruiser and Essex aircraft carrier. During the weekend, your captain will also be able to progress, gaining skills that will improve the ship’s combat readiness, while modernisations will let you improve the ship directly. Last year, Tim called World of Warships “quietly brilliant” and you can try to see what it’s like for yourself by signing up on the Wargaming website, or sacrificing your least favourite family member in an effort to get an invite code. The beta weekend kicks off on January 23rd, this Friday, and finishes on Sunday.